In an effort to share the region’s culture, history and accomplishments with Cobo Center’s 1.4 million annual visitors, the Community Foundation was one of a number of area organizations that provided funding for a massive 30′ x 30′ fresco at the Detroit convention center. “Detroit: Crossroad of Innovation,” by Detroit artist Hubert Massey, made its public debut this fall and focuses on the city’s global role in innovation — from the auto industry to Motown. Massey learned the fresco technique directly from an apprentice of Diego Rivera, ensuring that the rich legacy of fresco-making could remain in the region. The painting visually depicts the city in a timeline of fascinating heritage that can be recognized as a source of pride for generations to come. The public artwork showcases the region’s people and values by carefully incorporating symbols and prominent images reflecting Detroit’s pride and enduring influences from past, present and toward the future. It joins an extensive art collection at Cobo that features local talent and encourages visitors to explore the city to learn regional stories. It is also a part of a wave of acquisitions by Cobo Art in recent years from local artists including Tyree Guyton, Robert Sestok and Gilda Snowden. 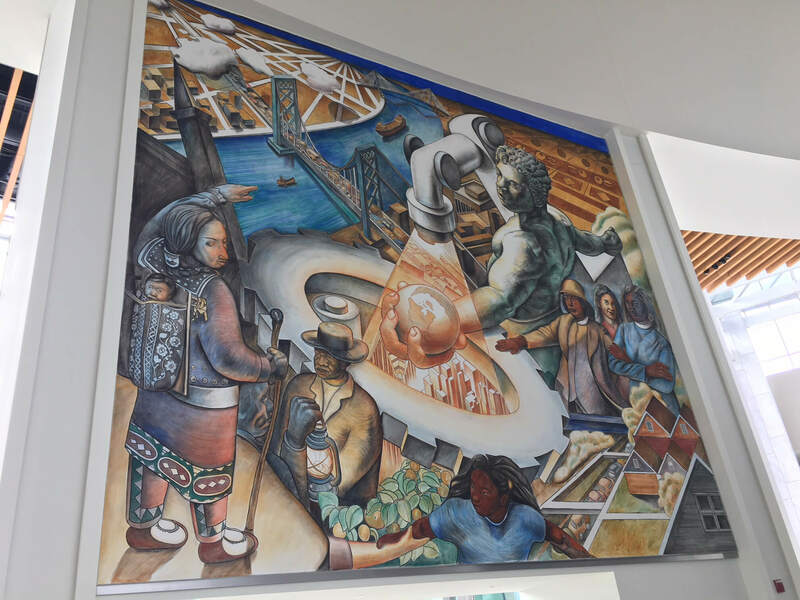 The fresco is designed in the tradition of Diego Rivera’s landmark “Detroit Industry” murals at the DIA in both substance, style and the fresco technique. It is estimated that six tons of plaster were used for the fresco. Over time, the colors will become deeper and richer. The Massey fresco is located near the entrance to the Riverview Ballroom within Cobo Center. Visitors can take a self-guided tour of the artwork on display at Cobo Center, where the Massey fresco serves as a centerpiece. The painting was commissioned by the Detroit Regional Convention Authority and the Detroit Regional Convention Authority Foundation. Support for Parks and Trails Honors Ralph C. Wilson, Jr.